Our personal experiences in our lives and the world around us can be used as inspiration when crafting a monologue. Follow this exercise to activate those moments and to bring a new life to your stories. 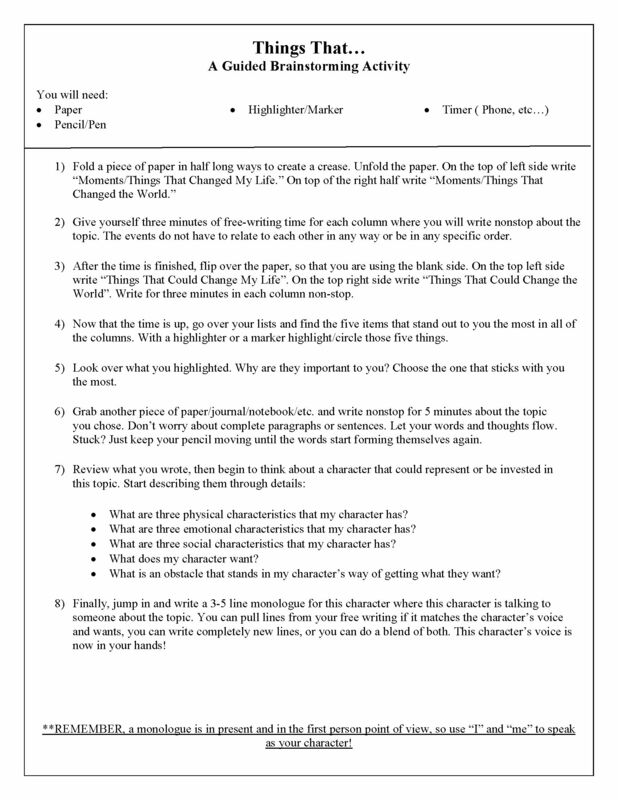 Give yourself three minutes of free-writing time for each column where you will write nonstop about the topic. The events do not have to relate to each other in any way or be in any specific order. After the time is finished, flip over the paper, so that you are using the blank side. On the top left side write “Things That Could Change My Life”. On the top right side write “Things That Could Change the World”. Write for three minutes in each column non-stop. Now that the time is up, go over your lists and find the five items that stand out to you the most in all of the columns. With a highlighter or a marker highlight/circle those five things. Look over what you highlighted. Why are they important to you? Choose the one that sticks with you the most. Grab another piece of paper/journal/notebook/etc. and write nonstop for 5 minutes about the topic you chose. Don’t worry about complete paragraphs or sentences. Let your words and thoughts flow. Stuck? Just keep your pencil moving until the words start forming themselves again. Review what you wrote, then begin to think about a character that could represent or be invested in this topic. Start describing them through details: What are three physical characteristics that my character has? What are three emotional characteristics that my character has? What are three social characteristics that my character has? What is an obstacle that stands in my character’s way of getting what they want? Finally, jump in and write a 3-5 line monologue for this character where this character is talking to someone about the topic. You can pull lines from your free writing if it matches the character’s voice and wants, you can write completely new lines, or you can do a blend of both. This character’s voice is now in your hands! **REMEMBER, a monologue is in present and in the first person point of view, so use “I” and “me” to speak as your character!